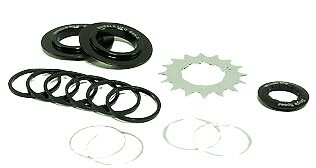 Shimano & SRAM compatible single speed conversion kit with chain guides. Large chain guides with diameters slightly larger than the cog keep the chain from hopping off the rear cog. Black anodized.